The taxonomic delimitation of the Superfamily Oestroidea is ex- tremely difficult and most authors disagree as to the limits of the group (see HORI, 1967, for a historical survey of Calyptratae classification). ROBACK (1951) included in Oestroidea the families Oestridae (with Hypodermatidae as subfamily), Cuterebridae and Tachinidae. STONE et al. 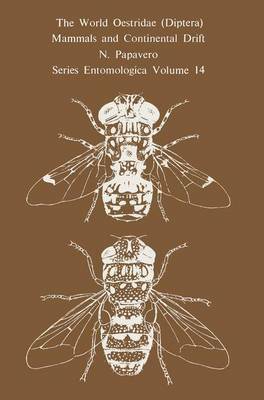 (1965) included the Calliphoridae, Sarcophagidae, Tachinidae, Cuterebridae and Oestridae (with Hypodermatidae as a subfamily). ZUMPT (1957) divided the Oestroidea into: (i) Oestridae, with sub- families Cephenemyiinae, Oestrinae and Hypodermatinae; (ii) Gasterophilidae (with subfamilies Gasterophilinae, Gyrostigminae and Cobboldiinae); and (iii) Calliphoridae, including, among others, the subfamily Cuterebrinae. I am considering as Oestroidea, for practical purposes, only two groups: 1. The Cavicolae (Fam. Oestridae) -larviparous Dies; the 1st stage larvae are deposited by the females directly into the nasal cavities of the mammal hosts; the larvae complete their development in several internal cavities. 2. The Cuticolae (Fams. Hypodermatidae, Rutteniidae and Cutere- bridae) -oviparous Dies; the egg is laid near the lairs of the host, on an intermediary vector, mainly haematophagous Dies (in the unique case of Dermatobia hominis), or directly on the host's skin, the egg being then adapted to adhere to the hairs; the 1st stage larva penetrates through the skin of the host, completing its development subcutaneously.